The air battles during World War II were brutal and deadly. These are the stories of the top three Soviet fighter aces. They shot down more enemy planes than the pilots of the RAF during the Battle of Britain. Only the very best German pilots of the time downed more opponents. 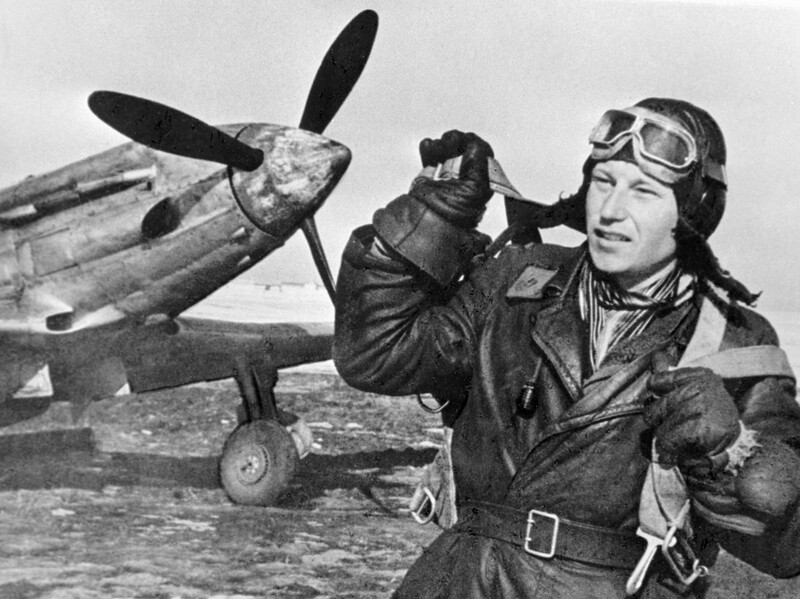 Ivan Kozhedub is both the top Soviet ace with 64 kills and the most successful Allied fighter pilot of World War II. However, Kozhudub’s first air battle could have been his last. His La-5 fighter suffered damage during a dogfight with a German Messerschmitt Bf-109. 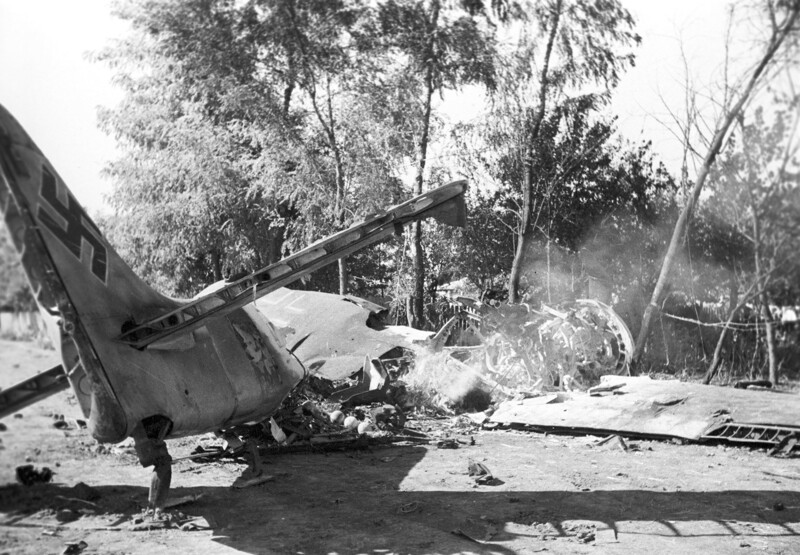 On his way back to base friendly fire from Soviet anti-aircraft guns almost completely destroyed his airplane. Even so, Kozhedub managed to land safely. It was the hallmark of Ivan Kozhedub that he always tried to save his plane. During the war, he was hit several times but never bailed out, still managing to nurse his crippled aircraft back to the airfield. Top Soviet ace took part in 120 air battles, but seldom took unnecessary risks. He was a perfect shot and preferred to target enemy planes from a distance of 200-300 meters. Among his victims were Ju-87 dive bombers, He-111 bombers, Fw-190 and Bf-109 fighters, and even one of the world's first operational jet-powered fighter aircraft the Me-262. 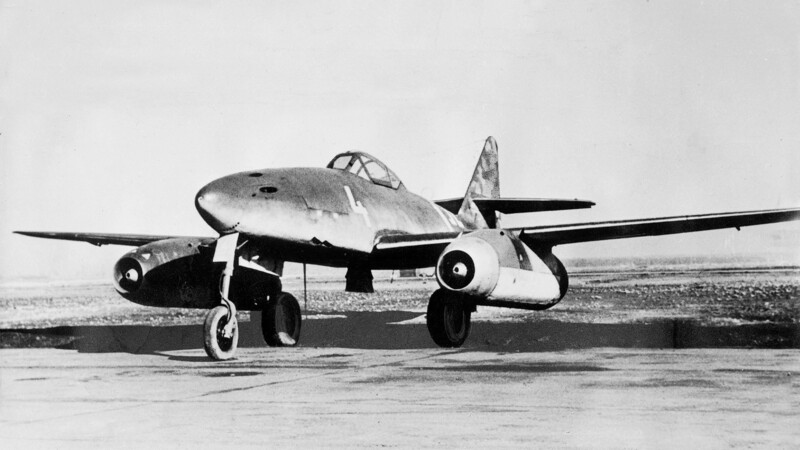 A German jet fighter Messerschmitt Me 262. It may sound unbelievable, but in the heat of battle Kozhedub was even forced to defend himself against American pilots. After repelling several German Messerschmitt fighters during the Battle of Berlin, he encountered American B-25 bombers and their escorting fighters who mistook him for the enemy. “Who are you firing at?! Me?! !”, Kozhedub recalled with indignation years later (link in Russian). Forced to defend himself, he shot down two P-51 Mustang fighters. Another time, when on patrol, he shot down several US B-17 Flying Fortress bombers that didn’t react to repeated warnings after intruding into Soviet occupation zone airspace in Germany. The distinguished career of the Soviet ace didn’t stop in Germany. Under his leadership, the 324th Fighter Aviation Division claimed 239 victories in the Korean War (1950-1953). 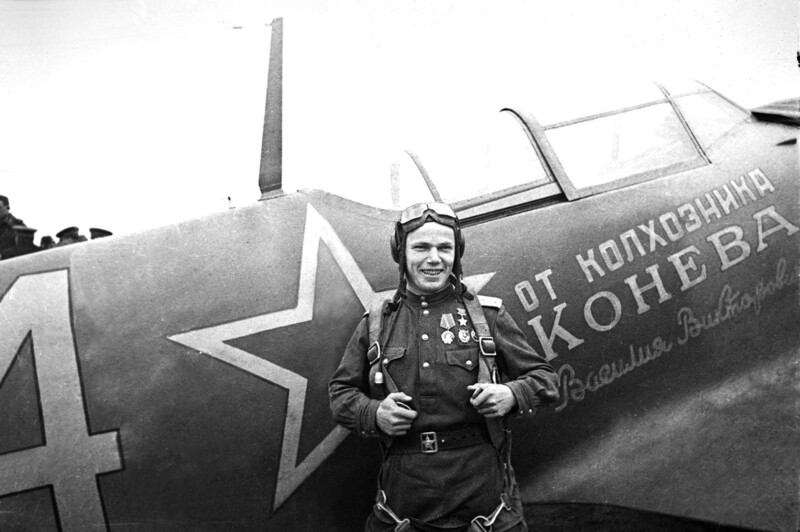 Thrice Hero of Soviet Union Alexander Pokryshkin near his plane. 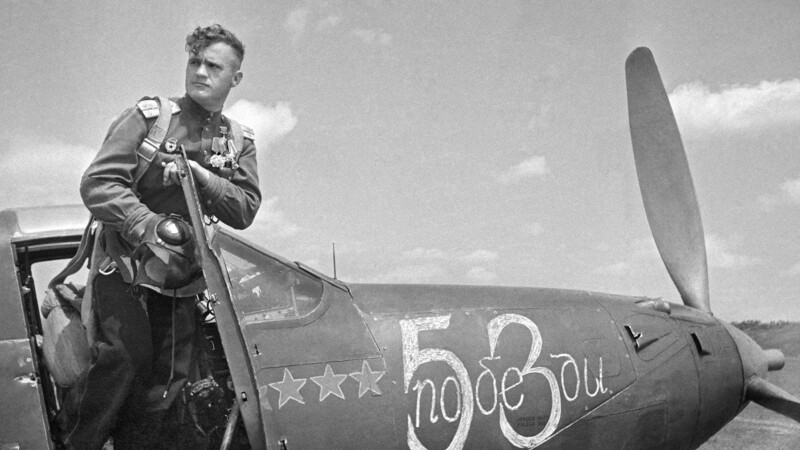 With 59 victories, Alexander Pokryshkin is considered the second-best Soviet and Allied ace. He started his military career as an aircraft mechanic, but always dreamed of flying. Pokryshkin applied unsuccessfully 39 times for a transfer to the aviation school, but at the 40th time of asking his request was approved. During the Great Patriotic War, Pokryshkin saw aerial warfare as not just a skill to be learned, but a science. He meticulously studied a log he compiled detailing each of the dogfights his squadron was involved in. Pokryshkin was among the few who understood how outdated the air tactics of the Soviet Air Force had become during the first part of the war and did much to improve them. Alexander Pokryshkin wasn’t one to take the easy option. He always tried to attack the lead plane in the enemy formation as that was the most difficult. Burning German fighter in 1941. The German pilots apparently few in terror of an encounter. It is told they used to warn each other: “Achtung! Achtung! Pokryshkin is in the skies”. “They fought on different theaters of operations and got acquainted only after the war. They couldn’t become friends when they were young, and in old age, it is usually even more difficult. So, despite meeting a number of times, they never became close friends,” Anna said. Twice Hero of Soviet Union Nikolay Gulayev. Although third in the ranking of Soviet fighter aces Nikolay Gulayev probably holds an unbeatable record as the most consistent fighter pilot ever. He shot down 42 enemy planes in his first 42 dogfights. Overall, he is credited with 57 aircraft shot down. Not so well known as his more famous contemporaries Kozhedub and Pokryshkin, he more than matched them in talent and dogfighting skills. His first combat flight in 1942 was not even sanctioned. When German aircraft appeared near his airfield, the experienced pilots were sent into the air. Without orders, rookie Gulayev joined them and shot down an enemy bomber. He was reprimanded for the unauthorized flight, but decorated and promoted for his first victory. Once he shot down two Ju-87 bombers, and when he was out of ammo, he fearlessly rammed a third. His Yak-1 went into a tailspin, but Gulayev managed to land the plane. It wasn’t only men shooting down enemy planes. Read about several Soviet women who became the top female aces of not just WWII but of all time.